The Vegas Robaina Famosos is a delicious and smooth medium-full Corona Extra, 5" (127mm) long, of 48 ring gauge, and comes in a 25 cigars box. It is surely a Robusto to place among the top 5, and in direct competition to Ramon Allones. 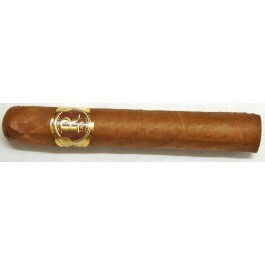 It is a medium-to-strong flavor cigar, very rich with lots of woody and earthy flavors, and some spicy touch. Despite being thick and short, the Famosos’ construction is extremely well done and very rich. An often neglected but awesome complex cigar. Very nice construction, with lots of creamy smoke, a nice clean burn and an easy draw. • Some taste of star anise and a trace of saltiness on the lips. • Creamy toasted nuts and toffee. A very well balanced robusto packed with complex flavor. A dark oily wrapper. A delight to the eyes. Very well constructed. A very nice tobacco aroma with a bit of barnyard, some hint of herbs. Foot smells of leather and tobacco and a hint of coffee. A slightly wavy self-correcting burn but with and even easy draw. The first third is medium in body with plenty of dark cocoa and a hint of pepper. The taste of pepper is more prominent in the second third with a touch of cream and dark honey. Dark cocoa is also present throughout this section with a medium to full body on the palate. Final third was more intense and becomes spicier with creamy dark chocolate with some espresso to the palate. In summary, a fine robusto to rival the top 5.